An online mapping system which displays information about turtles' nesting and migration habits should help to protect them against further survival threats. The Marine Turtle IMapS is produced by the UN Environment Programme, and will let researchers share data worldwide. The scheme is starting by focusing on the Indian ocean and south-east Asia, but is to be extended to other areas. Threats to turtles include fishing nets and hunting for their meat, eggs and shells, as well as loss of habitat. IMapS, the Iosea Marine Turtle Interactive Mapping System, is the work of Unep's World Conservation Monitoring Centre. It has been developed for the Indian Ocean-South-East Asian Marine Turtle Memorandum Of Understanding (Iosea). Douglas Hykle, who co-ordinates the work of the Iosea memorandum, said: "The ability to display marine turtle nesting and migration data in such detail over the internet will underpin international conservation efforts. "Some of the world's most important marine turtle populations are in this region, and many are seriously threatened. "Decision-makers need to be made aware of the importance of particular sites... and gain an appreciation of just how widely these animals range." Dr Klaus Toepfer, Unep's executive director, said: "With IMapS, anyone with an interest in turtles will be able to see global trends and patterns as well as details of specific projects. "The information will be available for decision making at all levels... a key to the effective implementation of international conservation plans." 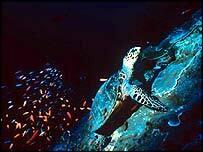 IMapS covers six species: loggerheads, flatbacks, green turtles, hawksbills, olive ridleys and leatherbacks. They face a variety of threats across the region. Damage to coral reefs, sea grass beds and nesting beaches is intensifying the other threats the turtles face. Some years the female turtles which return to their native beaches to lay their eggs produce fewer hatchlings than in others, and the project hopes to see whether this is a local issue or a global trend. A 29-year-old loggerhead named Premiere, who was tagged as a hatchling on an Australian beach in 1975, returned there last November and laid four clutches of eggs. She is the first of the turtles tagged that year to have returned as a breeding adult. Before she left on her northward migration she was fitted with a satellite-tracking radio transmitter, which shows she is covering about 26km a day along the Queensland coast inside the Great Barrier Reef. 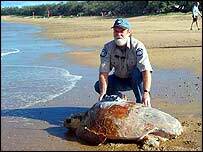 Dr Colin Limpus, of the Queensland parks and wildlife service, has been monitoring turtles for three decades. "With IMapS, the research community will be able to begin to see the priorities for conservation and improve our knowledge of the movements of the turtles," Dr Limpus said.